FILE - Myanmar farmers lay paddy for ventilation. The NLD promises to improve conditions for Myanmar's agricultural workers. The incoming government of Myanmar, led by the National League for Democracy (NLD), is expected to focus on improving the country’s agricultural sector and building on reforms launched by the government of President Thein Sein. While Myanmar – also known as Burma -- has experienced much economic reform since the military made way for more civilian control since 2011, change has been slower to come to the agriculture sector. Sean Turnell, an academic from Australia’s Macquarie University and informal advisor to the National League for Democracy (NLD), said that is about to change. “So the story above all is that in agriculture things are not really good. So a reorientation of economic policy towards agriculture, making life better for Burma’s farmers and cultivators and rural population generally – that’s where we’re going to see a really strong focus,” said Turnell. Some 70 per cent of Myanmar’s 54 million people make their living from agriculture. But many face high levels of debt, and a failure of the local credit system has forced many farmers into the hands of money lenders. Turnell said reforms to Myanmar’s agricultural bank will also help provide more credit to farmers, as will the easing of government regulations that some say have inhibited growth in the sector. Myanmar’s economy, buoyed by foreign investment and an easing of international sanctions, has experienced economic growth of around 8 percent a year and seen more than $8 billion in funds flow in from overseas investors. Other crucial reforms expected include giving the central bank greater independence, including more ability to deal with inflation, currently running at 13 percent. Asian Development Bank (ADB) senior representative Peter Brimble said reforms launched by President Thein Sein’s government have set benchmarks but several challenges remain. “There are three key challenges this economy is facing – one is to maintain stability – like macro-economic stability and peace and stability. Second is to address the critical infrastructure constraints and improve service delivery of transport services, energy. Third would be education and training; building the ability of civil servants and private sector to operate in a modern world,” said Brimble. Analysts say international donor and lending institutions, such as the World Bank, USAID and the Asian Development Bank (ADB) have also been preparing development programs with many set to be launched in 2016 and 2017. 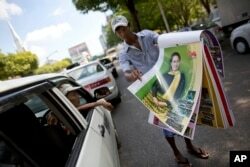 FILE - A street vendor unfolds pages of a calendar featuring Aung San Suu Kyi in a Yangon street, Myanmar, Nov. 12, 2015. But Phil Robertson, Deputy Asia Director for U.S.-based Human Rights Watch, said there are still concerns about whether the NLD-led government will be able to carry out reforms with the economy still largely controlled by the military or business cronies close to the military. The military-controlled group Union Myanmar Economic Holdings, with investments in brewing, gems, real estate and transport, still faces sanctions by the United States. “Foreign investors need to be aware of who they are doing business with and whether their investments are also going to be causing human rights abuses. We see land grabbing as a problem all over the country – whether increased foreign investment is going to exacerbate that problem or whether there will be some sort of solution to try and reform the way land is handled in Myanmar,” said Robertson. Analysts say the increased attention to boosting growth in Myanmar’s rural and agricultural sector will help increase rural incomes, currently among the lowest in Southeast Asia.